Around the age of six months, your baby will probably start weaning. But milk will still be their main drink and a key source of nourishment. Cows' milk is fine to use in cooking, but government guidelines say you shouldn't use it as your baby's main drink until 12 months. 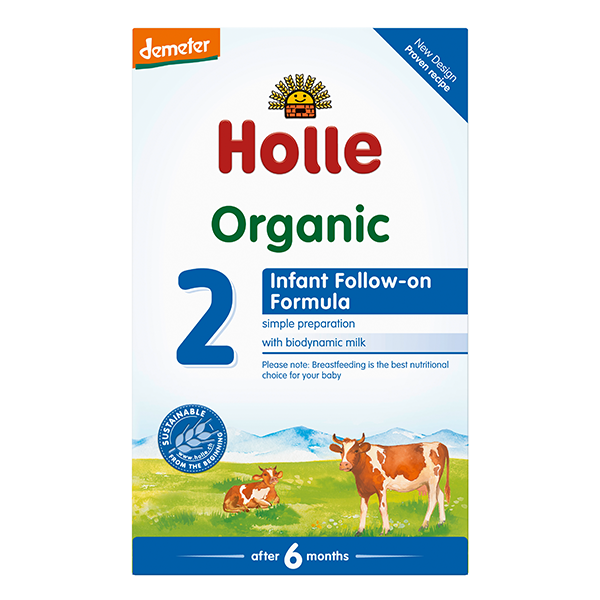 If you care about food quality, you want to choose the healthiest, most natural follow-on milk you can - and that's Holle Organic infant Follow-on Formula 2. At this crucial time, your baby needs additional nutrition to support their growth and a more active lifestyle. If their hunger can't be satisfied with Holle Formula 1, Formula 2 Follow-on Milk can be used from six months to one year, either in combination with breast milk or as part of a mixed weaning diet. Holle Infant Follow-on Milk is 100% free from gluten, wheat, soya and has no added sugar, fish oil and GM ingredients. For your baby's healthy development, none of the Holle baby milks have added fluoride. It's easy for your baby to digest - and it tastes great! Preparation is quick and easy - just add boiled water. 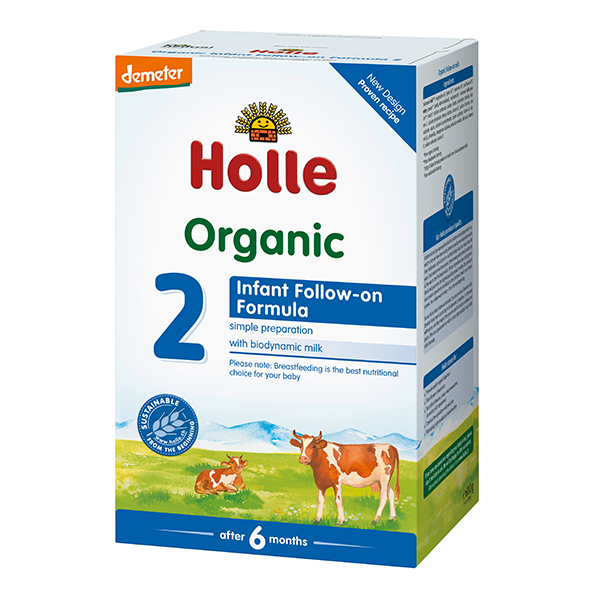 Holle Organic Follow-on Milk is produced from 99% organic ingredients plus vitamins and minerals (which are required by law). Holle only sources from local farms, so all the milk used comes from a trusted, known origin. Each farm raises its cows in a natural, caring environment where they are free to graze in organic fields cultivated according to modern biodynamic principles - in tune with nature and completely without chemicals. And because Holle Formula 2 is made with such high-quality milk, its nutritional value is unbeatable. Other important ingredients include organic vegetable oils which provide essential fatty acids for your baby. Organic starch and maltodextrin derived from corn make the Organic Infant Follow-on Formula 2 creamy and filling. 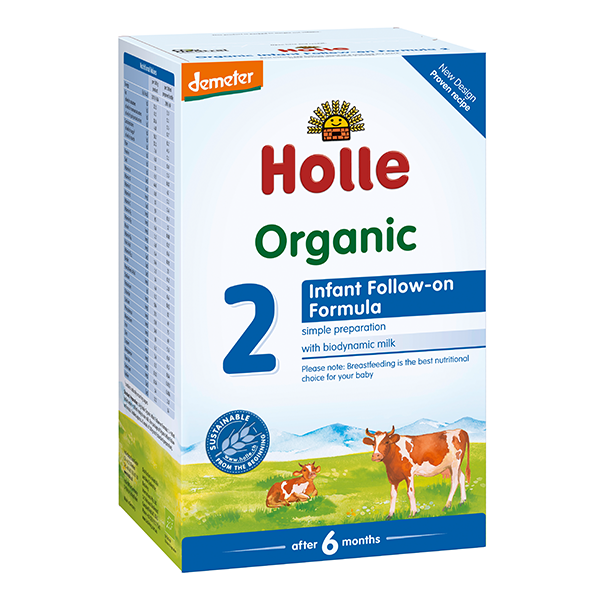 If you care about your baby's food and you need a formula milk to satisfy your hungry baby, Holle Organic Infant Formula 2 is the only follow-on milk you should consider. Holle organic baby milks and infant formula are now CO2 neutral. Gluten free, non-sweetened (contains naturally occurring sugars; lactose from the milk), instant preparation - no cooking required. No fish oils or meat by-products are added. The whey powder used cannot be guaranteed to be vegetarian. Energy: 494 kcal/100 g milk powder or 69 kcal per 100 ml prepared bottle. of which poly-unsaturates 5.4g /100 ml milk powder or 0.8g per 100 ml prepared bottle. Protein: 11.6g/100 g milk powder or 1.6g per 100 ml prepared bottle. Carbohydrates: 58.7g/100 g milk powder or 8.2g per 100 ml prepared bottle of which sugar 36.0g /100 g milk powder or 5.0g per 100 ml prepared bottle of which lactose 34.8g/100 g milk powder or 4.9g per 100 ml prepared bottle of which starch 7.6g/100 g milk powder or 1.1g per 100 ml prepared bottle. Great quality, I trust all Holle’s products and baby has no issues at all when drinking it. I also want to mention how fast their deliveries are and how perfectly packed. Not to mention the greatest customer service. My baby loves the follow on milk. She has been breastfed till 9m and we slowly moving to follow on milk. She has been very happy on it. I ordered a batch of boxes and they arrived very quickly. Great service! It was the first formula milk we have tried after breast milk. My son likes it and doesn’t seem he prefers breast milk more No any tummy issues or skin irritations been noticed. normally I add this formula in my baby porridge, and he loves it. I really love this milk my baby never had any problems with his little tummy. Brilliant formula organic I am very happy about this product and would recommend to anyone . We experienced a little bit of a problem with delivery due to some oversight from the Post Office. Lucikly for me, Chris jumped into action and sent out another shipment without delay - which saved my entire holiday in the U.K.! By far, one of the easiest and best customer service experiences I have ever had. Highly recommend ordering from this wonderful online store! The packaging of my baby's formula and jar food was exceptional. Can't say enough good things about this shop! Thank you Chris & Ulula for saving the day! I have been ordering Holle through Ulula for both my children. I live in Canada and our formulas simply don't compare. It's at my door within a week. The service and communication with Sophie keeps me coming back! Also a very good one ! I really liked this formulas, agreed with one other review that it is not as creamy, but for some reason my baby enjoyed it even more then formula one. I just have ordered a second set. Quality is fantastic , its like a real milk , smell,taste I am happy to give it to my baby. Great service, great product, fast delivery. Thank you!